OVERVIEW Nursery Cottage is a quality, individually designed dormer bungalow with a stunning backdrop over open rolling Herefordshire countryside. The property offers extremely spacious and versatile accommodation and may suit those looking for multi-generation living or working from home. The property is in immaculate order and the delightful gardens have been beautifully landscaped. Cloakroom: Two piece cream suite with wood-effect flooring. Master Bedroom: A lovely light room with picture window taking in the stunning views to the rear, fitted with 'his and her' wardrobes with further storage over. En-suite Bathroom: Three piece white suite with separate shower cubicle and shower. Conservatory: A delightful room with views over the gardens and surrounding countryside, with windows to three sides and central French doors leading out onto a half circular patio, great for 'Al fresco' dining. Study/storeroom: Open office space with internal window and courtesy door to the rear of the property. Second sitting Room/ Bedroom 4: A good sized room with windows to rear and side aspects. 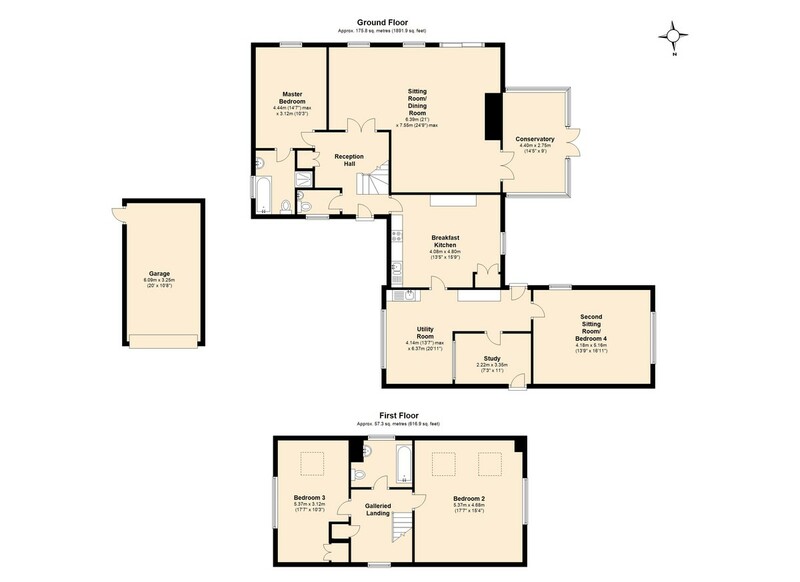 It is worth noting that the area that combines the utility room, study, second sitting room/ bedroom 4 would make an ideal annexe or workspace for those choosing to work from home. Galleried Landing: A light and open landing with fitted shelving to one wall, heated linen cupboard and window overlooking the front aspect. Bedroom 2: A spacious and light room with window to side aspect and velux to rear taking in the splendid views. There is a built-in storage cupboard with hanging space and storage over. Bedroom 3: A very spacious room filled with light from the window to side aspect and the two velux windows taking in the picturesque countryside views. There is built-in storage with further under-eaves storage. Bathroom: Three piece white suite with built-in storage. EXTERIOR The front of the property is flanked by brick pillars with central wrought iron gate with mature hedging either side leading to the gravel driveway and garage. The gardens have been beautifully designed and landscaped and flow seamlessly around the property. There are meandering pathways, numerous formal borders filled with vibrant colour and fragrance from the abundance of flowers and shrubs which are complimented by the natural areas of fruit-producing bushes to include gooseberries, blackberries and autumn raspberries. There are also fruit-bearing trees to include plum, pear, bramley apple, eating apple and the beautiful sweet chestnut tree which dominates the front of the property. An attractive archway covered in clematis leads through to the 'secret' rose bush garden area. Flagstone path meanders from the front of the property leading to two patio areas with further larger seating area to the rear. There are three sheds, a greenhouse and a single garage with electronic door and courtesy door to the side and two outside taps. LOCATION Nursery Cottage is set in the heart of the lovely village of Wormelow, with shop, public house and garage. The property offers perfect village living with the benefit of nearby larger amenities. The market towns of Ross-on-Wye and Monmouth are approximately 11 miles away, both offering a variety of individual shops. The Cathedral City of Hereford is just over 6 miles away. The A40 is approximately 11 miles away and gives access to Newport and Wales or Bristol and the South. The M50 is approximately 12 miles away and gives access to the midlands and the north.